Nadine Robinson’s sculpture “Tri-Christus” is on the roof of the SITE Santa Fe building, where the show “Lucky Number Seven” will run through Jan. 4. “It’s not the outcome that’s important, it’s your intention,” Lance Fung said. Fung is the curator of SITE Santa Fe’s seventh international biennial “Lucky Number Seven.” Unlike previous biennials at SITE, and those held around the world, this biennial is about process, experimentation, collaboration, communication and energy. It is a biennial about experience. Not about outcome. Consequently, all work is temporary; it will exist only until the end of the exhibition. There was also a no-fabrication rule, requiring the artists to create their works by hand, not necessarily their own hands, but the hands of local artists, community members, volunteers and board members. Fung partnered with 18 institutional partners and 19 curators to select 25 emerging artists from 16 countries for this biennial. Typically, biennials are about art stars and collectors, about crowds and fancy parties. And while that element was not eliminated in “Lucky Number Seven,” Fung and his partners, in hopes of minimizing the spectacle, set parameters. All work is a new commission. All work is site-specific and made in Santa Fe. Additionally, all artists received the same stipend of $7,500. Many artists donated their works and some took months off from their day jobs to make art that they know is not saleable. “What I did not want to happen in this biennial was for works of art from this utopian process to then be pimped out and sold into the marketplace. I have no problem with collectors or anything like that, I think everyone should live with art, but what I’m not interested in is the spin, the promotion, the branding and the capitalization of the art that often happens in the art world,” Fung said to the Phoenix New Times. This biennial will have no precious objects to end up in a gallery, museum or collector’s home. Bronze will be melted down and remade into something else, wood will be donated to Habitat for Humanity and plastic will be recycled. It’s a utopian concept rooted in Fluxus (Latin for “to flow”), an art movement from the 1960s based on the concepts of composer John Cage. Fluxus valued simplicity over complexity and included a strong current of anti-commercialism favoring an artist-centered creative practice. Fluxus artists worked with whatever materials were at hand and often collaborated. “Lucky Number Seven” is rooted in Fluxus and Fung’s notion of creating a community of artists not working in isolation, but coming together to collaborate. Dealers for many of these artists are already receiving phone calls from collectors looking to purchase work. The opening weekend, last weekend, was filled with gala events with ticket prices ranging from $250-$25,000, the latter for a table at all of the weekend events. SITE was established to host a biennial, and the biennial allows for the raising of money required to run such an organization. Many Santa Fe galleries were also cashing in on the weekend, hosting openings of exhibits by art stars like Jenny Holzer, whose iconic installation “Gallery D” from the 1990 Venice Biennale is a short walk across the street from SITE. And in many ways collaboration creates spectacle. Nora Naranjo Morse, Eliza Naranjo Morse and Rose B. Simpson’s familial collaboration (they are mother, daughter, niece) snakes, literally, through Santa Fe, hanging in trees and draping over buildings. “Story Line” is made from clay, willows, waddle, linseed oil, rice, nylon and thread. These Santa Clara Pueblo artists have woven their installation to interact with other installations. The most powerful aspect of the work is where it ends inside the SITE Santa Fe building and breaks into shards. “Story Line” made from clay, willows, waddle, linseed oil, rice, nylon and thread by: Eliza Naranjo Morse, Born in 1980 in Española, New Mexico /Lives and works in Santa Fe, Nora Naranjo Morse, Born in 1953 in Española, New Mexico /Lives and works in Española, and Rose B. Simpson Born in 1983 in Santa Fe, New Mexico /Lives and works at Santa Clara Pueblo, New Mexico. 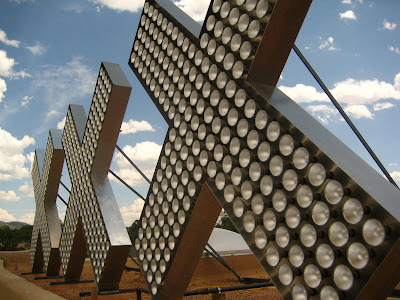 Japanese artist Hiroshi Fuji invited the community to participate in his installation “Kaeru.” Local artists created 23 toy sculptures at the Museum of International Fold Art and 30 plastic bottle sculptures hanging from the light poles at the Santa Fe Opera parking lot. 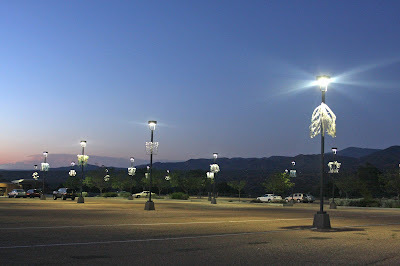 Above and left: Plastic water bottle sculptures commissioned by Hiroshi Fuji and executed by Santa Fe volunteers hang from light posts in the parking lot of the Santa Fe Opera. All the artwork featured in “Lucky Number Seven” is temporary and will be taken apart after the show. Marti Anson from Spain brought part of a demolished flour mill from his hometown to New Mexico and reconstructed it in the Museum Hill Auxiliary Parking Lot. “I carried out the whole project with my own hands, as an act of faith to save the heritage of my home town. I built a copy of the original flour mill, brick by brick. After the exhibition, the building will be handed over to the city to be used for any function other than being an artwork,” he writes in his artist’s statement. Nick Mangan, an Australian artist who lives in Berlin, provided one of the most intriguing works called “A1 Southwest Stone,” a reconstructed archaeological dig at a building on Alto Street in a residential neighborhood. Creating the dig provided the artist with “a way of gathering information about the local history and myths, sieving through some of the facts and fictions, upturning some of the dried mud.” The narrative is so well constructed that one is unaware what is real and what is fabricated, from the partial walls in the dug out trenches to the newspaper clippings on the wall. The SITE building also provides an interactive experience, as architects Tod Williams and Billie Tsien have restructured the interior. A ramp winds through the building allowing for moments of wonder and magic, glimpses of art from above or through a cutout in a wall. Short documentary films about each artist and her or his work play near the entrance. Because visitors have not had the same experience as the artists, curators, staff and volunteers, the documentaries are the most important works in the show because they integrate the audience into the process. “My goal at SITE Santa Fe was to make a biennial that would touch and inspire the mainstream public as much as the art world,” Fung writes in the catalogue. A lofty goal because the mainstream public mostly understands art when it is a precious object and an outcome. artsjournalist@mac.com Leanne Goebel attended “Lucky Number Seven” as a project of the Creative Capital/Andy Warhol Foundation Arts’ Writers Grant Program. She is a freelance writer and curator in Pagosa Springs. "Lucky Number Seven," SITE Santa Fe Biennial, 1606 Paseo de Peralta, Santa Fe, 87501, through Jan. 4, (505) 989-1199, sitesantafe.org.